Treat that fish catching Mom right this Mother's Day with a nice fishing gift that she'll actually use and have fun with. Sure, a bouquet of flowers are always a nice gesture. She may even let you know how beautiful and sweet smelling they are. You almost cannot go wrong there, right?. Except for one thing... those beautiful flowers are going to die off in a week or so. Be more personal this year for that special child bearing woman. It could be your very own Mom, your step mother, foster parent, guardian, grandma, girlfriend, fiance, best friend, aunt, cousin, sister, or even your daughter. If she loves fishing, why not get her a thoughtful fishing gift for Mother's Day!? 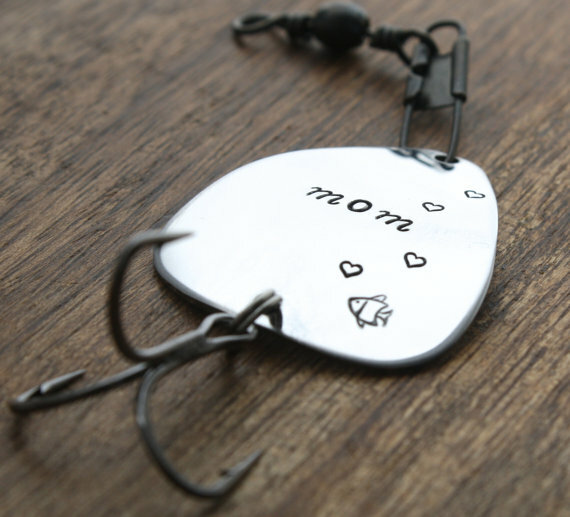 Fishing lure with "MOM" engraved on it - a cool Mother's Day gift idea. Personally, I believe that creating memories is one of the most special gifts to acquire. To help accomplish that, consider going fishing together with that magnificent lady. Women love jewelry! And if Mom loves to fish, then maybe she could sport some fishing jewelry to look all cute out on the water at the same time that's she catching fish. There's earrings, necklaces, pendants, rings, bracelets, charms, pins and brooches, cuff links, and watches. Themes include hooks, bobbers, fish, boats and kayaks, engraved words, and other neat fishing related stuff. One of my personal favorites is this Infinity Love, Fishing, and fishing charm suede band bracelet as shown in the picture. It also comes gift box wrapped on delivery. Click on the image if you think that would make the perfect Mother's Day fishing gift! Shop here for fishing jewelry . Use the search box to look for more awesome stuff that you think she would like. There's a ton of fishing equipment to choose from, including starter kits and combos. Or find novelty items such as shirts and coffee cups with cool Mom stuff on them. Top 10 fishing gift ideas for fishermen. Father's Day fishing gift ideas. I Got The Creek Monster - A visitors story and picture of her great catch on Mother's Day.